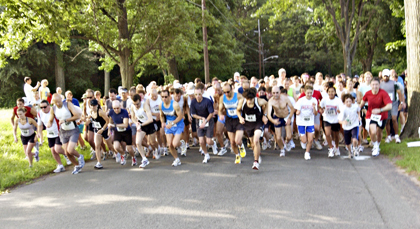 FIRST STEPS: Runners at the June Fete 10k race take off after the starting gun last Saturday on FitzRandolph Road. Princeton resident Glenn McIsaac placed first among the 491 finishers as he covered the 6.2 mile course in a time of 34:32. For more details on the race, see page 45. As the October deadline for an updated community master plan looms, Princeton planners are still grappling with Princeton University's future, and, as of Tuesday, continue to have many unanswered questions. Princeton Borough Council last night was slated to get its first taste of what could end up being a thorough development of some 30 acres of fertile land along Princeton Borough's Bayard Lane and Paul Robeson Place, currently comprising Princeton HealthCare System's Merwick Care Center, Princeton University's Stanworth Apartments, and the YM/WCA. In 2000, some concerned residents wrote a letter to the editor asking if it were possible to have a "respectful dialogue" on in-town development that would outlast the inevitable disagreements. In an annual nationwide examination of prowess in the language of Pascal, Descartes, and Madame Curie, not to mention Napoleon, De Gaulle, and Brigitte Bardot, 20 students attending Princeton High School excelled at the state and at the national levels. Winners included a first prize at both national and state levels to beginning French student Emil Jahng. Borough Hall, facing a potential tax crisis in light of last month's court ruling granting the University Cottage Club historic site designation, leaving the municipality on the hook for five years of back taxes, is now looking at ways that could potentially offset the tax burden on Borough taxpayers. Following recommendations by both a municipal commission and an outside consultant to transform a mid-century Princeton Township development into a historic neighborhood, Township officials are now looking for alternatives to historic designation, hoping to find middle ground. As a 19-year-old fencing star for his club in Hungary, Zoltan Dudas had his sights set on going as far as he could in his competitive career. Libby Bliss was looking for some redemption as she toed the starting line for the 800-meter run last Wednesday at the NJSIAA Meet of Champions. After 17 seasons at the helm of the Princeton Post 218 baseball team, manager Tommy Parker has yet to lead his team to the Mercer County American Legion League (MCALL) playoffs. As municipal arborist and open space manager for Princeton Township, Greg O'Neil spends more time out and about in Princeton than he does behind his desk at the Department of Public Works on Witherspoon Street. The Boston native and Bridgewater resident typically spends an hour in the office and seven on the road taking care of plantings on Princeton Township's 16 and a half square miles. With an intimate knowledge of the town's flora that includes 13,000 street trees, he is reluctant to pick a favorite species but reveals a fondness for the white oak and for the tree known as the Washington Oak. Since the loss of Princeton's signature Mercer Oak, he has planted many of its descendents around town. Here, in his own words, he describes his work.